Submitted by Taps Coogan on the 7th of February 2019 to The Sounding Line. With the shale oil revolution pole-vaulting the US from the world’s largest oil importer to an exporter (of sorts) in 12 short years, once popular theories of ‘peak oil‘ are all but dead. Such theories, which warned that global oil production was nearing its absolute maximum and that ensuing shortages would send prices through the roof, were wrong. It turns out there is a lot more oil in the ground than people realized just ten years ago. Yet, as important as the amount of oil being produced is the population of people consuming it. 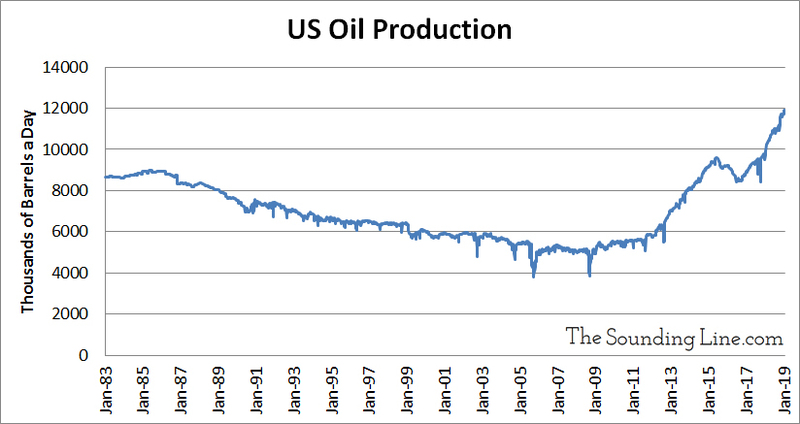 Since we first wrote about this subject two years ago, US oil production has surged a mind-boggling 38%. 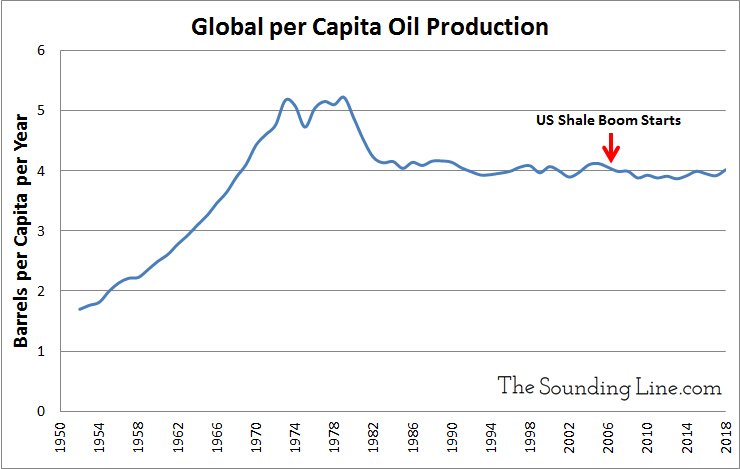 However, global per capita oil production has barely budged. As of October 2018, the most recent date for which data is available, global per capita oil production is lower than it was in 2006, when the US shale oil boom was in its infancy and US oil imports were peaking. 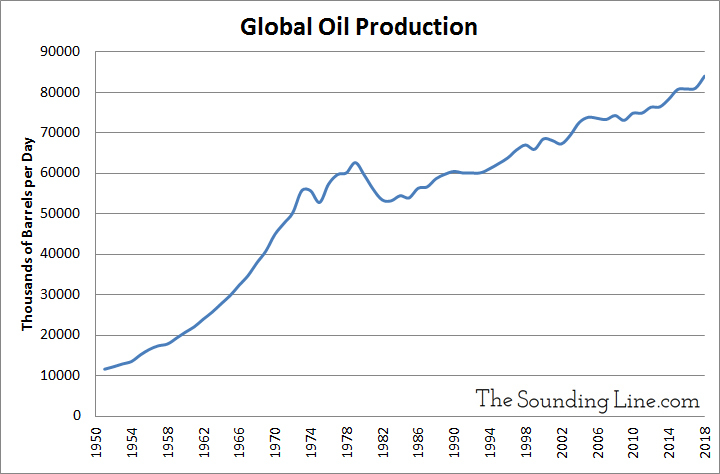 In fact, global per capita oil production has been trending lower since its peak in 1979. On a per-capita basis, growth in US oil production has barely offset declining production in most other parts of the world. Meanwhile, emerging markets have been working furiously since the 1980s to raise hundreds of millions of people out of poverty. With a rise out of poverty comes increasing demand for cars and transportation that is still overwhelmingly powered by oil. From the 1990s to today, global automobile sales have nearly doubled from about 40 million to 75 million units per year. As we have previously noted, oil being consumed by the burgeoning global consumer class has been freed up by nearly eliminating oil based electricity production that is easily replaced by cheaper coal and natural gas. 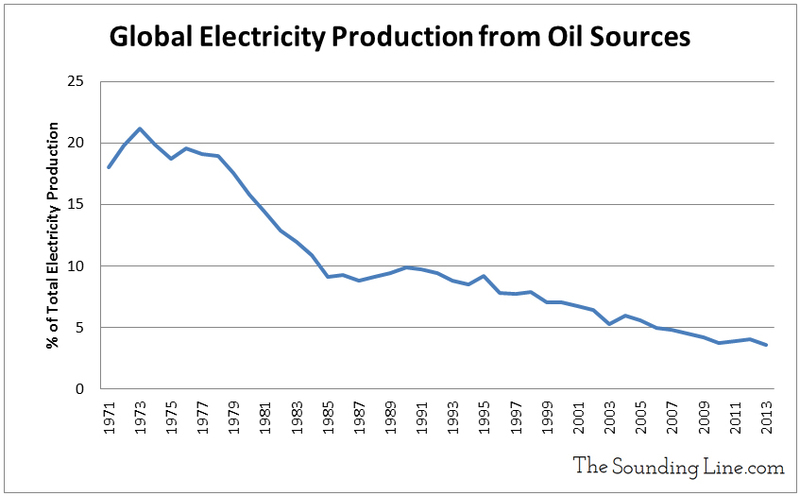 Globally, electricity production from oil fell from 21% in 1973 to less than 4 % today. If increases in US shale production cannot be sustained, either due to the higher depletion rates of shale plays or due to the tightening financial liquidity available to capital intensive shale companies, global oil supply may become tighter than many people are currently forecasting. The rise of electric cars may mitigate the problem, but in doing so, will transfer the energy burden to electric grids. Despite over $2.9 trillion dollars of global investment over the last 14 years, renewable power still represents less than 5% of total global primary energy consumption. So while electric mobility could become a solution, unless electric grids can grow capacity dramatically while simultaneously eliminating fossil fuels, it is not one yet.